Background: The mitzvah dance fulfilled the Torah commandment to dance before the bride. Due to the requirement that males and females not touch, either a handkerchief, a belt, or the train of the bride's dress was used to replace holding hands. The master of ceremonies (badkhn) traditionally called up male wedding guests to dance with the bride, one at a time. The dance was also called the Kosher dance indicating the bride had undergone ritual purification prior to the wedding, and also sometimes called the Shabbes Dance. See also abstract of Judith Brin Ingber's article under references, regarding Jewish dance in Poland between the wars. 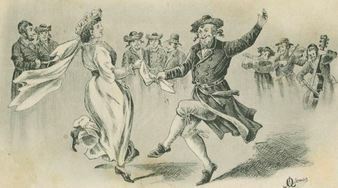 Rivkind differentiates the term mitzvah dance as being dancing with the bride and groom, whereas the kosher dance referred specifically to dancing with the kosher (ritually pure) bride. The bride'seyes would be downcast; i.e., she would not make eye contact with the men she danced with. In addition, the kosher dance might also refer to the rabbi dancing with his followers, the Hasidim. The bride went back and sat among her attendants. In the same way she “danced” with every gentleman present, all this time veiled. When it was almost light, everyone sought some corner and the entire company nodded off in blessed slumber." world all stepped carefully. This is the way they did it." Miriam Shomer Zunser distinguishes between kosher tanz and mitzvah tanz—as 2 different types of dances—the kosher dance involving various family members, mitzvah only the bride + various guests (see resource page for reference). For a more complete discussion of this dance, please see the article written by Zvi Friehaber listed under published resources. "They formed a parade. The bride and groom went together, following the klezmorim band. Chaia Sara Mendeleyev was also in front, dancing a "Kosher Tanz" (Kosher Dance). Her job in the Shtetl was to entertain the Bride and Groom. She danced holding a headscarf in one hand and her robe with the other hand." So here we have an individual woman dancing what is being called kosher dance, to entertain the bride. Another Example: "The tables were taken out after the blessing and the young people again began to dance until daybreak. But in the middle of the dance Yudl Badkhn called out: “Now we will dance the mitzvah tantzl!” Or as it was also called, the kosher tantz [kosher or pure dance]. He offered his large red pocket kerchief. The bride held one corner and the groom the other and whoever had God in his heart and a long arm held the kerchief with at least two fingers. The klezmorim played a “lively one” and everyone, men and women, turned in circles. And unnoticed, the groom and bride left the dance. The kosher tantz was the only one in which everyone was permitted to dance together, men and women." 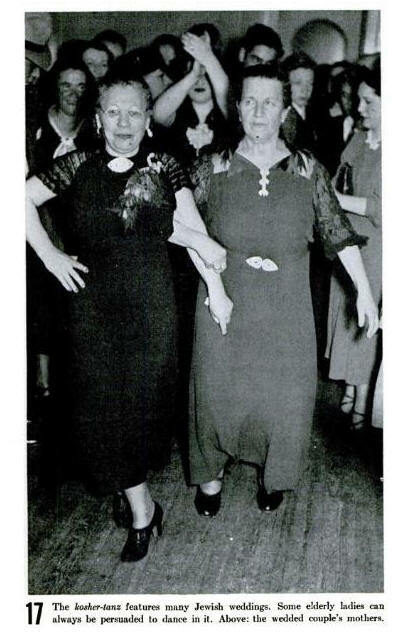 The photo above comes from Life Magazine April 5 1937, page 7, and the caption says it represent the kosher Tanz--but involves only the mothers in law--so perhaps this is yet another version of the Kosher dance. the dance or the result would be chaos. For another example of a choreographed mitzvah dance, see Fred Berk's version in 100 Israeli Dances. Teaching Tip: I always tell people not to worry too much if they don't get the footwork quite right. After all this was originally an improvised dance. The only concern is that people change partners at the same time to avoid colliding. To ensure everyone's safety I shout "change" each time partners change until the group seems comfortable with the dance. Formation: partners facing in a circle, man facing out (back to centre of circle), woman facing the man. Each partner holds a diagonal corner of of the handkerchief fairly high, about head level, in their right hand. Men and women do the same footwork. Music: a 4/4 or 2/4 piece of klezmer music freylekhs or bulgar will work. If using faster music, I prefer to use 2 beats per step. If using a slower piece of music I use one beat per step. Notation below is for 2/4 music, one beat per step. (2), man picks up the hankie again. step left (2) moving one place over, now facing a new partner, and man picks up the hankie.